Copyright © 2006 Thomas J. Sterling, Jr. All rights reserved. No part of this publication may be reproduced, stored in a retrieval system, or transmitted, in any form or by any means, graphic, electronic, mechanical, photocopying, recording, or otherwise, for commercial reason without the prior permission of the copyright owner. The user of this publication may, for personal use only or for purposes of instruction to youth groups such as, but not limited to, Boy Scouts of America, Girl Scouts of America, YMCA/YWCA, church youth groups or other non-commercial related youth groups, print or produce hardcopy output or otherwise reproduce the carving patterns contained herein for the purpose of personal and non-commercial use. Persons conducting classes for the purpose of education may likewise reproduce the instructions or patterns for use only as class or individual student projects. What this means: You are welcome to use these instructions, copy these instructions, print or otherwise distribute these instruction in an unaltered form, as long as you don’t make any money from this activity. Not one thin dime. 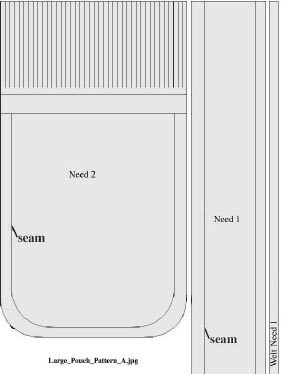 You may not include these instructions in any group of other items for distribution if you are making money from such distribution. In fact, if money is involved in any way in the distribution of these instructions, you’re probably violating the copyright! I’m not charging you, don’t you charge anyone else! It requires Adobe Acrobat Reader (free download from www.adobe.com) although you probably already have it on your computer – most newer machines come with it already installed. 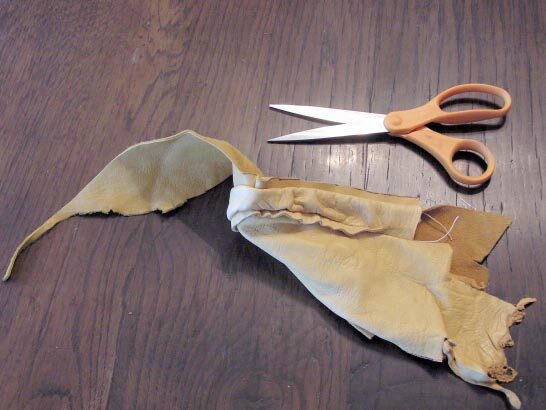 Here are instructions for making a high quality buckskin pouch, as presented to me by a good friend who is a member of the Ute Indian nation. He received his instruction from his grandmother, an unbroken line of oral tradition from the distant past. A small piece of history, and a great honor for those of us without a direct connection to our roots. 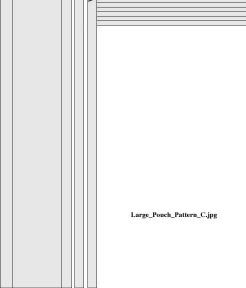 You’ll ﬁnd full size, printable patterns in this document, in three different sizes, for three sizes of pouches. 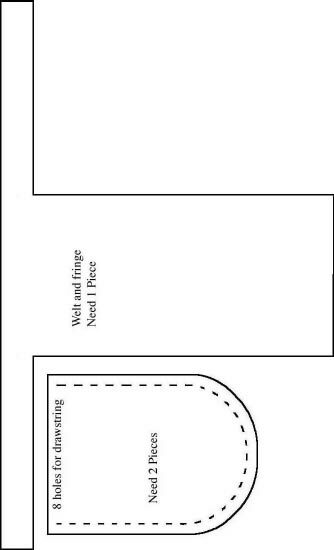 The largest and middle size patterns will be printed out in three parts, which need to be cut out and taped together. 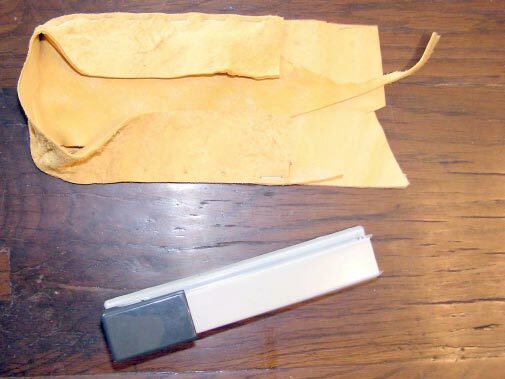 The pouch consists of ﬁve separate pieces, the front, back, side portion and two welts that ﬁt in between the front and side pieces. One of the welts has a larger section that will become fringe once the pouch is completely assembled. The welts improve the looks of the pouch markedly, and have a practical side as well. They provide a thicker seam, allowing the thread to be pulled below the surface, and protecting the threads from being cut by the contents of the pouch. I printed the instructions, glued the separate sections together (some of their dimensions are larger than a single sheet of paper), pasted them onto cardboard and then cut them out. 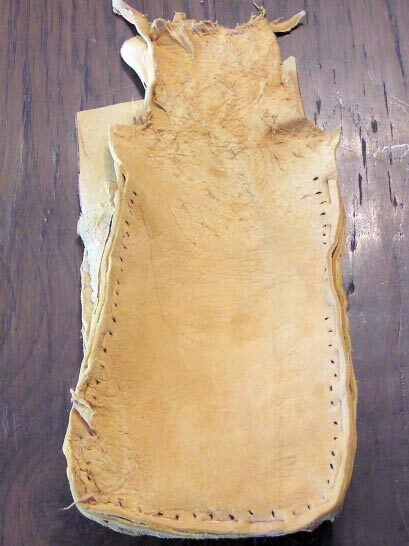 Here’s an image of the patterns traced onto the buckskin. I used a ballpoint pen to trace the patterns onto the leather, because ballpoint ink won’t run like felt tip pens will. 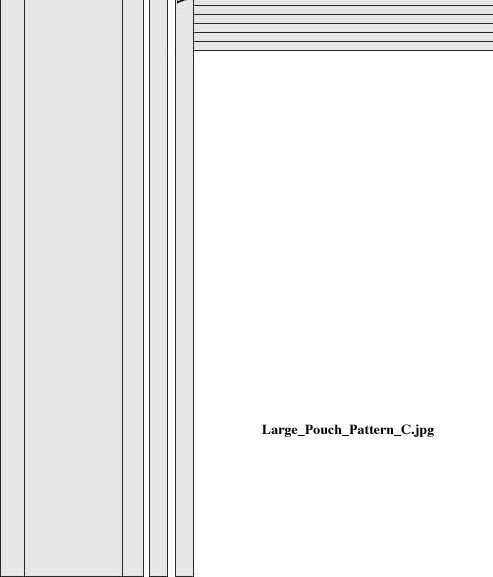 Here’s an enlargement of the welt with the fringe section. Notice the long thin portion isn’t laid out in a straight line. Long, thin sections don’t need to be laid out in a straight line. 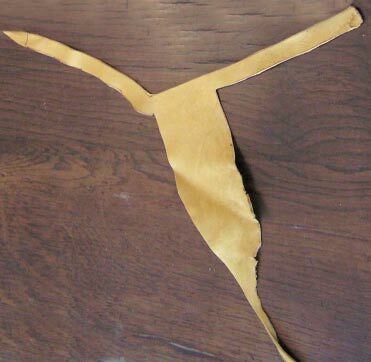 Since they’re going to be curved around anyway, you can wrap them around and save a little leather. Here are the ﬁve pieces cut out. Notice I didn’t cut out both of the welt patterns, since other than the rectangular portion for the fringe, they are identical in size and thickness. Also, notice I left the bottom of the fringe section long, and it’s not square along the bottom. I simply accepted what the leather was like in that position, since I’ve found that uneven fringe looks the best. At least to me. Also, the front and back portions have the same kind of uneven tops, since those areas will be folded down to make fringe with as well. I recommend you look for uneven sections of the skin for your fringe areas. Now we’ll begin assembling the pieces. Here I’ve laid the back section down, good side up (the smooth side, not the rough ﬂesh side). On top of that, I’ve laid the fringe welt section, also good side up. Now I’ve laid the side piece on top, ﬂesh side up, and centered on the back section. 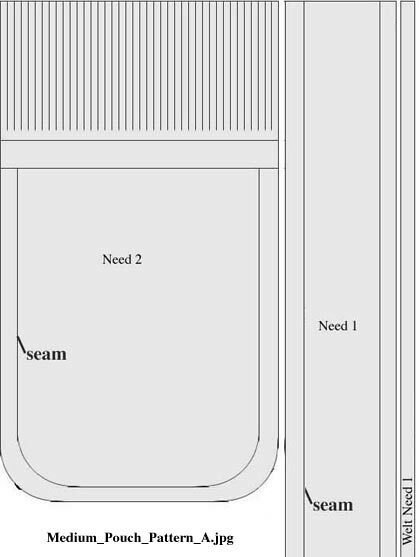 You can easily ﬁnd the center of the side piece by folding it double – the fold is the center. We’re assembling the sections in this order because we’re going to be sewing the pouch together inside out. Once we’re done sewing, we’ll turn the pouch inside out, and this arrangement will result in the good sides of all the sections ending up on the outside, and the good side of the fringe facing to the front side of the pouch. To hold it all together we could pin it, but I’m constantly running the pin into my ﬁngers since the leather is fairly tough. A far easier solution is simply to staple it together. Much easier on the ﬁngers, and we’re going to trim the stapled portions off later. 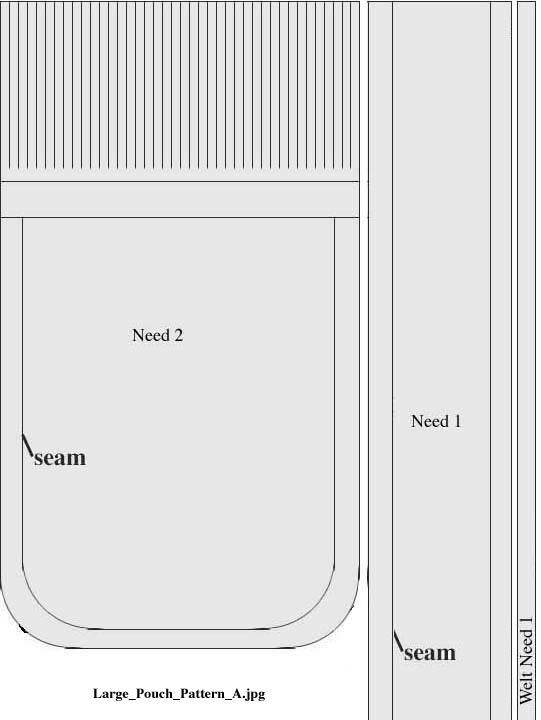 Be sure to staple reasonably near the edge, as we’re going to make the sewing seams inside of the staples. Here’s a close-up of the staples. I’ve used the magic of the computer to draw in the seam. If you’re unsure of yourself and want to draw in a seam line, use pencil lightly, not pen. Ink is permanent and will look terribly in the ﬁnished pouch. All of the ink marks we made laying out the pattern will be trimmed off at the end. 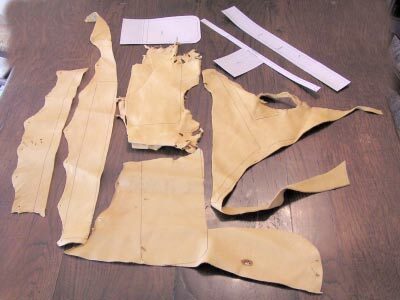 We’re ready to poke holes in the leather for sewing. The ancient ones would have used an awl to make the holes, but we’re going to use modern medicine. Above, I’ve taken a two inch ﬁnishing nail like the one at the top of the picture and clipped off the head and sharpened the point. We’re going to chuck the nail into a drill press and actually drill holes in the leather. 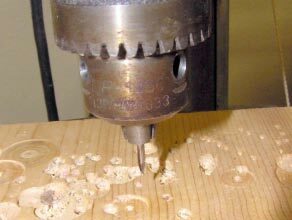 If you don’t have access to a drill press, leave the head of the nail on and use a hammer and piece of wood. Here’s the nail chucked in the drill press. 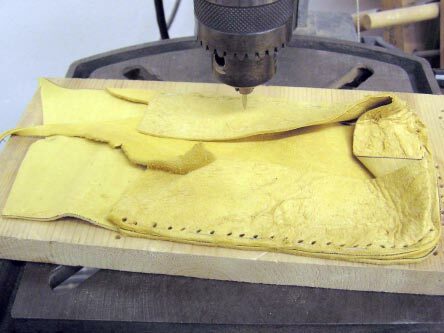 We’re using a sacriﬁcial piece of wood to lay the stapled leather on, and drilling through the leather and into the wood. By the way, don’t use a drill bit for this. 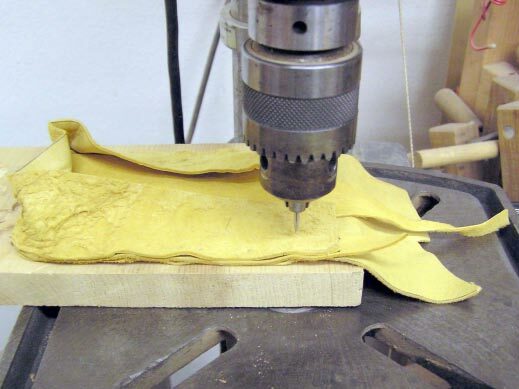 Drill bits will remove leather as they make holes. You’re left with a large hole that won’t close up and hold tightly to the thread. 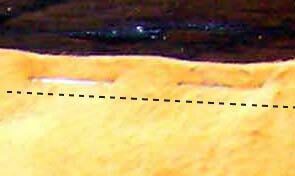 The sharpened nail simply spreads the leather apart, and will close up later, holding tight to the thread. Here’s the drilling operation. 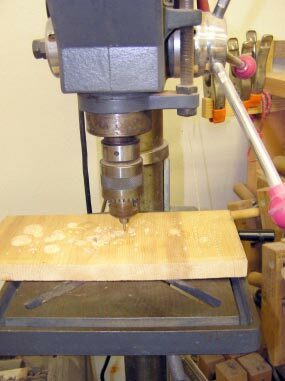 Once I’ve drilled a hole, I move the leather and the wood at the same time to the next position. This seems easier than moving just the leather. Here’s the ﬁnished row of holes. I’m drilling them about 1/8 of an inch apart. Now we’re ready to begin sewing. Here’s an image of the drilled leather back, side and fringe welt sections assembly along with the sewing awl. You’ll need to pull out enough thread to go around the drilled seam about two and a half times. 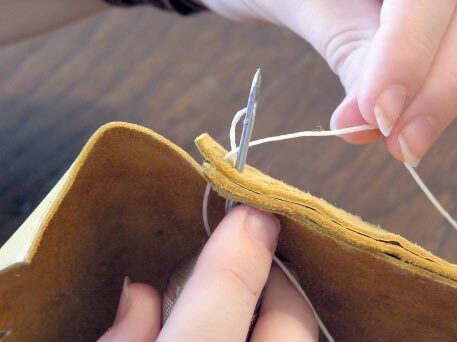 I’ve begun sewing the seam by inserting the needle through the ﬁrst hole in the end, grasping the loop of thread and pulling it all the way through the hole, then pulling our the needle. It doesn’t matter which end hole, just choose the one you feel the most comfortable with. Now insert the needle into the next hole, and pull it back out a little. 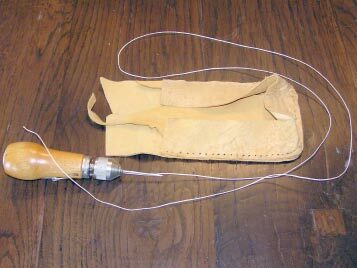 This should form a small loop next to the needle, on the side away from the awl. Take the loose end of the thread and thread it through the loop. Pull the thread all the way until it is taught, and pull the needle all the way back out. 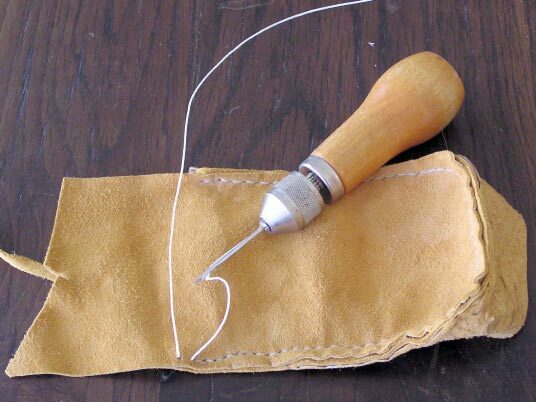 You should have the free length of thread on one side, and the thread attached to the awl on the other side. 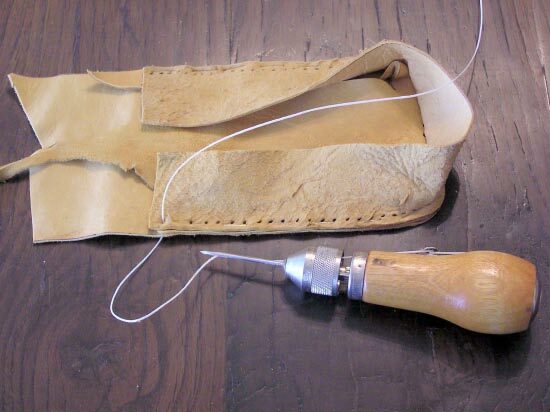 Pulling the thread from both sides, pull the resulting “knot” down into the three layers of leather, hiding the knot and pulling everything tight. Don’t break the thread. Work your way around the entire seam. 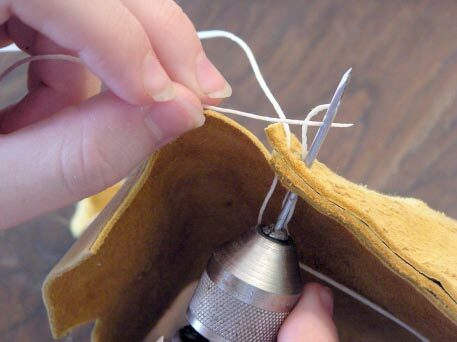 To ﬁnish the seam, insert the needle through the last hole, thread the free end through the loop, then pull the needle completely back through the hole. 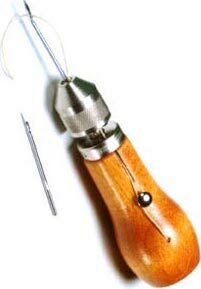 This time, pulling on the awl end thread, pull the free end thread all the way back through the hole. 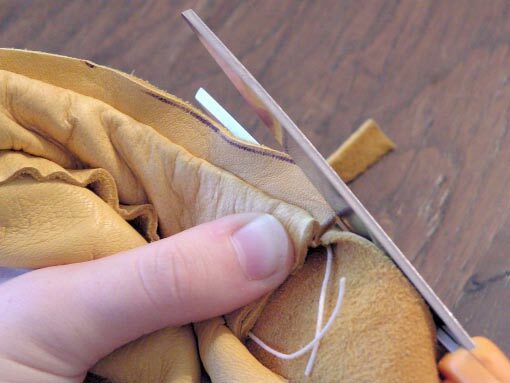 You should wind up with both threads on one side of the leather, rather than a thread end on each side. Now cut the thread near the awl and tie a square knot. Carefully put a drop of superglue on the knot to prevent it from unravelling, being careful not to get the glue on the leather, since it will discolor the leather badly. Now we’re ready to staple the front section onto the already sewn back and side portions. Be sure to place the long thin non-fringe welt section between the side and front parts. Note the front section is placed good side in. It doesn’t matter which direction you place the welt section. Here’s the whole thing stapled and drilled, viewed from the front side. 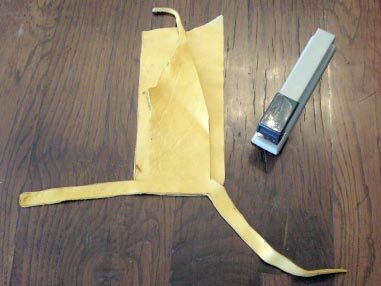 I found it easier to drill with the back side up, manipulating the leather back and side out of the way as I worked my way around the seam. Here’s everything sewn and tied off. Now we’re ready to turn the whole thing inside out. Here’s the pouch turned inside out, viewed from the front side of the pouch. Now it should be clear why we assembled everything paying attention to which sides faced in and out. Now we’re ready to trim the welt portions close to the seams. Just use a large pair of sharp scissors for this task. Here we’re trimming the welt. The idea is to trim the welt closely but not so close as to cut the threads. Here’s the trimmed welt. Be sure to trim the welts on both sides. Here’s a close-up of what your ﬁnished trimmed welt should look like. I’ve also trimmed any excess from the side portions, trimming about 1/8 of an inch above the threads. Then, fold over the top, making a cuff about half an inch wide. 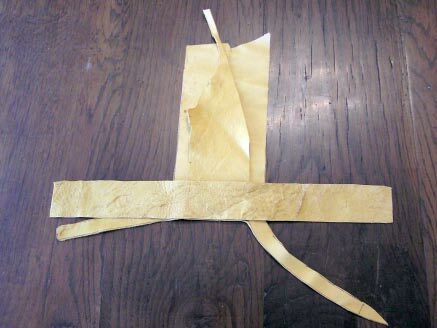 Here you can see how the excess leather from the front portion folds over, leaving leather for fringe. We’re now ready to punch holes for the drawstring. This is one area where messing things up is quite easy, because the number of the holes matters! If you get the numbers wrong, then the drawstring won’t work or won’t emerge correctly. Here we’re going to punch two holes in each side, and two evenly spaced holes in the front and back sections, for a total of eight holes. On the prototype you can see I ran a seam around the top. This is optional, since the drawstring will hold everything in place. 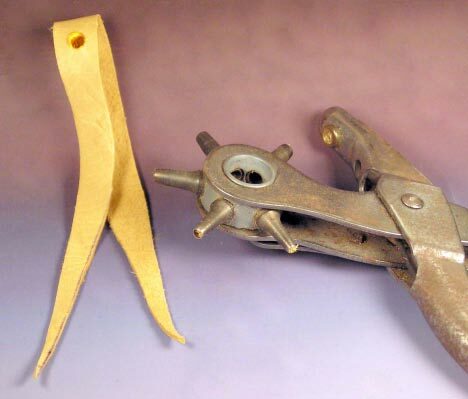 It’s preferable to use a leather punch, but if you don’t have access to one, you can cut small slits. Slits are inherently weaker, however, and may rip with continued use. 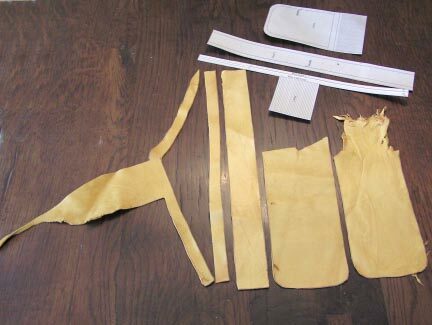 Select a leather thong for the drawstring, and choose a leather punch size that will allow the thong to slide easily. 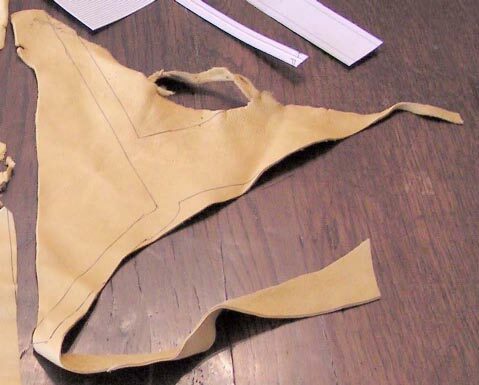 Use a scrap of leather to determine which size hole works best. Here are the punched holes, along the sequence for threading the drawstring thong. I’ve also used a sharp pair of scissors to cut the fringe on both front and back sections around the top, and the long fringes at the bottom. Here is another make or break point, since smaller fringes look better. You can tell if a lazy person cut the fringe if they are wide. For an alternative look, you can wet and twist the fringes tightly. Here’s the ﬁnished pouch, both open and drawn closed. I like to put small carved embellishments to dress up my pouches. 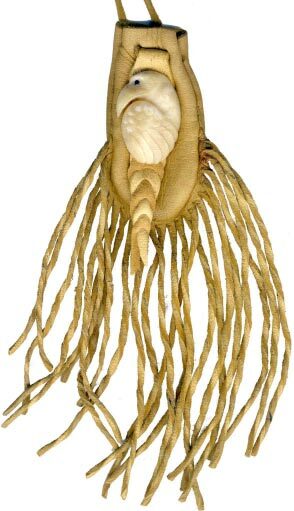 You can also put trade beads on some of the fringes, and the ends of the drawstring thongs for added decoration. Enjoy! Group of pouches, large sized, medium and tiny. 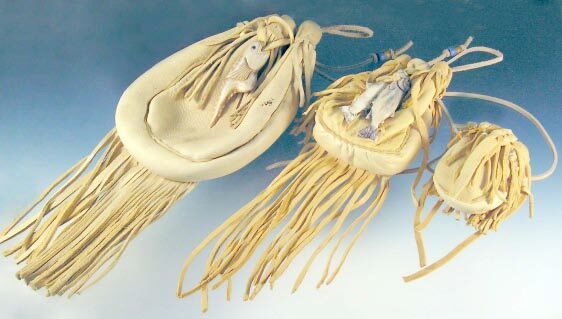 Medicine Pouches – These are some small medicine pouches I’ve been making, each with a small carved talisman. They’ve been a lot of fun, and popular with my friends. 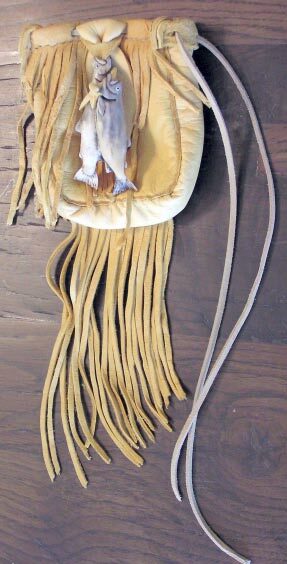 This medicine pouch has a small antler orca (killer whale) talisman in Northwest Native American style. On the back of this talisman is a slot-like himotoshi to allow the “bleed knot” fastening device. 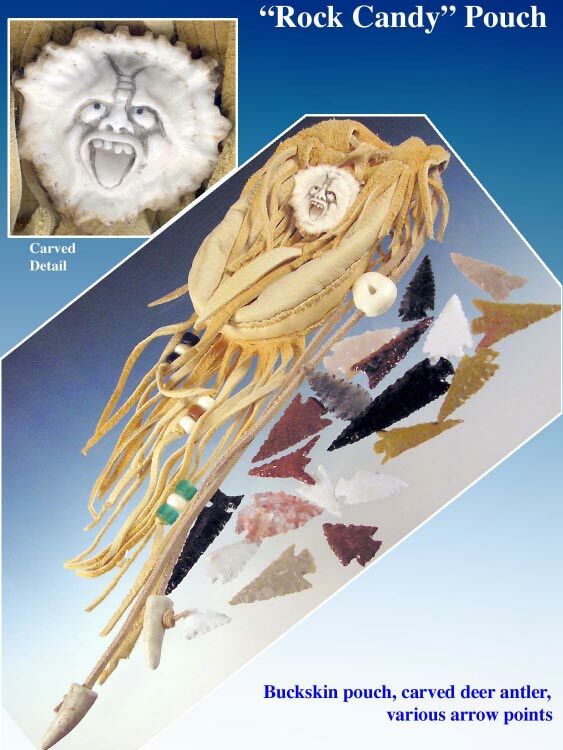 The medicine pouch is about 2 1/2 inches tall, and is designed to be worn around the neck. 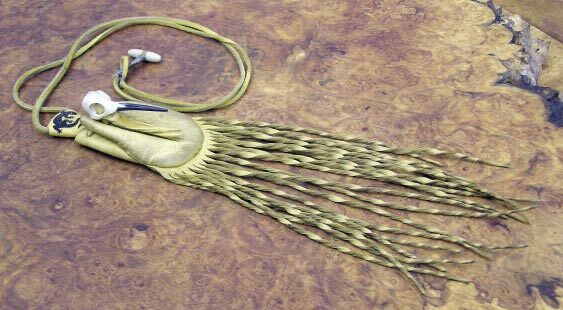 Note the neck cord that is arranged to be both pouch closure and necklace, with an antler toggle fastener. 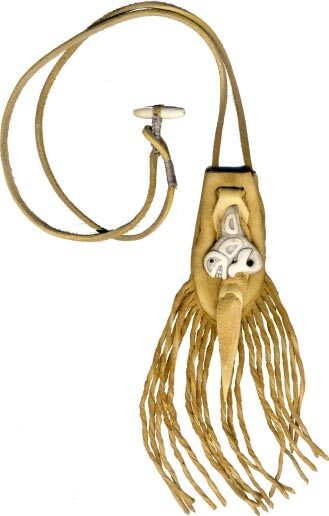 The antler toggle is simply a rod of antler, tapered and smoothed on both ends, with a groove around the center so the buckskin thong could be tightened and not slip off. I cut the fringe as the last thing in making the pouch, then soak it in a dilute water based stain (in this case a natural walnut hull stain) to darken the pouch a little, and get rid of the yellowish “new” look of the leather. You have to squeeze the leather a bit to get the stain to penetrate well. While the pouch is wet, I twist each fringe, then twist each one a little tighter a few days later when the pouch is completely dry. After that, the twist is pretty permanent. A word of note, the talisman isn’t attached during the staining and drying, or it would be stained as well. There are 8 thong holes for the pouch closure. If you are going to alter the number of holes, do so with a good bit of forethought. The number of holes is critical if you want the thong to enter and emerge in appropriate places. Above is the lacing sequence for 8 holes. 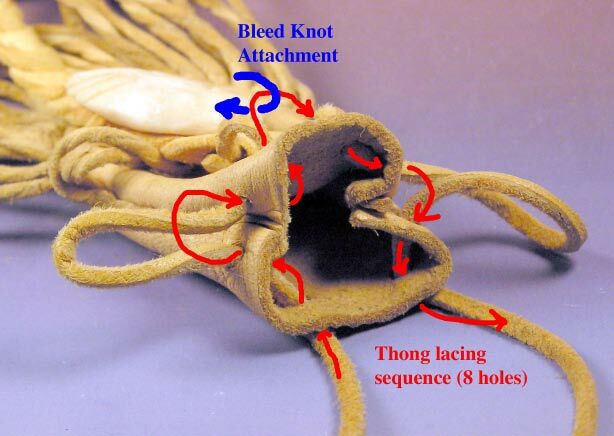 Note the place where the bleed knot is attached to the closure and necklace thong. Here’s how to make the bleed knot. 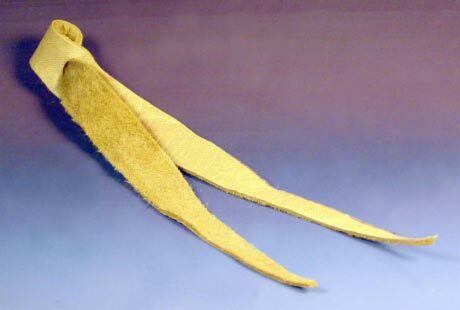 Above is a strip of buckskin, about 5 inches long and tapered on both ends. Any sort of soft leather will work for this. 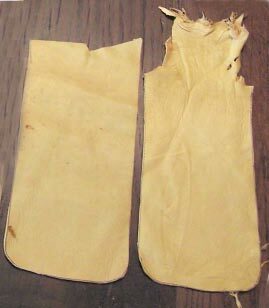 I’m using buckskin so it will match the medicine pouch. I’ve folded the strip in half to find the center, and about half an inch down from the center I’ve punched a hole. You can also make a vertical slit if you don’t have a punch like the one shown. Since my buckskin strip is about 1/2 inch wide in the center, I’m using the largest size punch setting. Now take the end from the half that wasn’t punched and feed it through the hole. Pull it on through until the gap left at the top is the appropriate size. 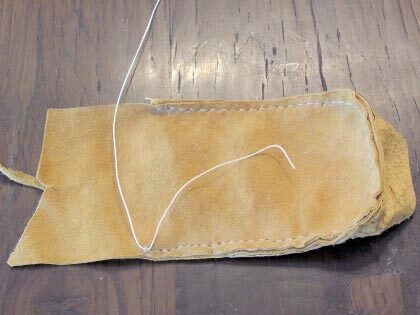 In this case, I want the gap about 1/4 inch in diameter, to attach to the closure thong on the medicine pouch. You make it the right size for your application. Now punch another hole in the half you just passed through the first hole. 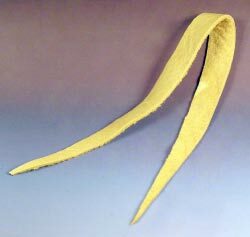 The distance from where the strip emerges from the first hole to where you punch is about half the width of the strip at that point. The only thing you can do to mess up the bleed knot is to punch the hole in the wrong half. Remember, the hole is punched in the OTHER half, not the half you just punched the hole before. The half you just passed through the hole is the one that receives the next hole. This will alternate all the way along the bleed knot. Again, take the other tip and pass it through the hole you just punched and pull it up snug. You will probably need to spread the strip out and sort of “fluff” it up in the spot where it emerges from the hole. Here’s what it looks like so far. We’ve punched two holes and passed the ends through twice. Now, punch another hole in the half that was just passed through the previous hole. Make sure you get the right half punched. Pass the other end through, and pull up tight, fluffing as you go. Here we are with three holes punched, three ends passed through. Continue on as long as you want to. Somewhere along in here, if you plan to add a talisman like I’ve done on my medicine pouches, you need to pass the end through your carving, then through the next hole. In that case, of course, you’ll have had to punch the hole a little farther down because of the carving. I string on the carving and then punch the hole where it’s needed. And here’s the finished bleed knot, ready to install on the pouch, or whatever you had in mind. 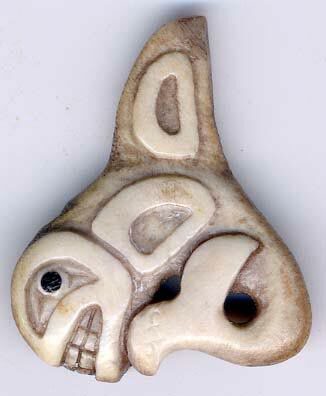 This medicine pouch has a raven talisman, carved in fossil ivory with an inlaid ebony eye installed on a bleed knot. I soaked the ivory in a linseed oil based wood finish to give it that translucent look. 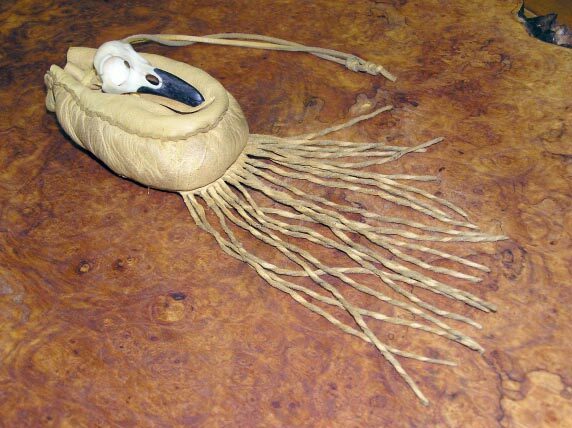 This little medicine pouch has a hummingbird skull talisman, carved out of a piece of moose antler, and the beak carefully darkened with Procion dye. 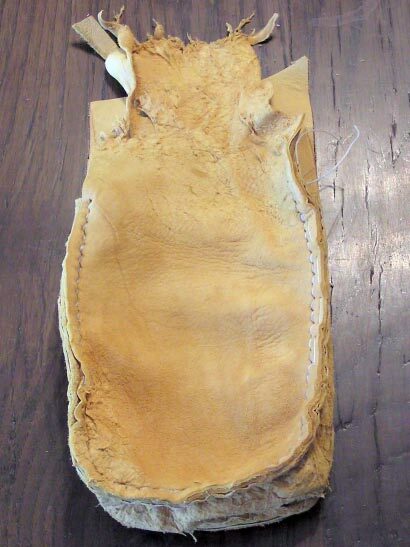 I also included a small boxwood slide that slides up both sides of the buckskin neck thong and keeps the pouch closed. I woodburned a small twisty lizard on the slide. The slide has two carved thong holes at the top corners that merge into one thong hole which comes out at the bottom. 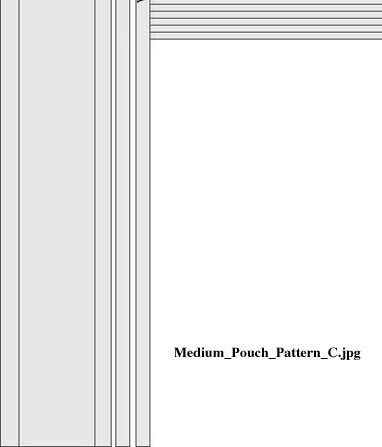 For the buckskin pouch we’ve been working on so far, you’ll need to print three pages for a complete pattern. The patterns are too large for a single sheet of paper. 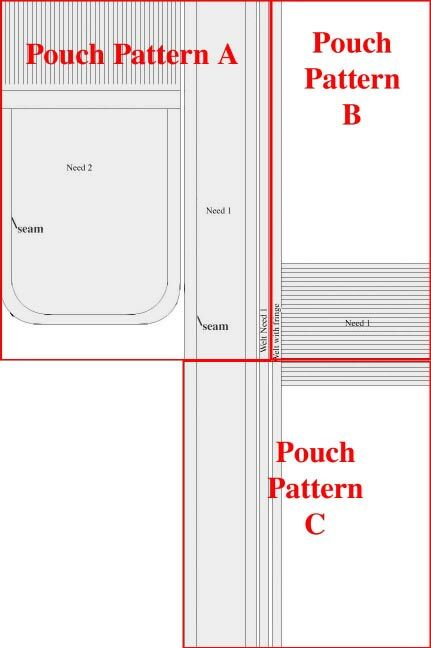 The three pieces of the pattern look like these small examples shown above, printed on three separate sheets of paper..
Below is the pattern for the medicine pouch. 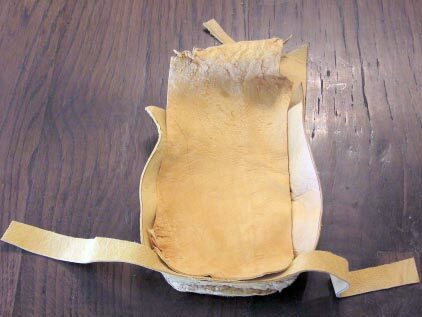 Made somewhat like the buckskin pouches shown before this section, the medicine pouch has only three major parts. They are a front and back, and a combination welt and fringe piece. This pattern prints out on a single sheet of paper, and uses very little leather. I really like this sit. I like the pattern they are pretty . Would be nice to see step by step for me hard to read. You’re welcome! Hope they’re of use.